Durable, all-welded 18 gauge x 1½ square tubular steel frame for added rigidity. 3,000lb capacity. Welded base plates allow floor anchoring for stability. Scratch resistant enamel finish. 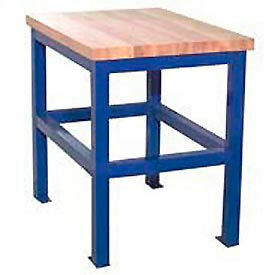 Available in 3 Bench Tops: 1 5/8 thick almond plastic laminate, 1¾ thick Shop top or 1¾ thick maple top. Optional 4 casters for mobility, reduce capacity to 1,000lbs. Available in Beige ,Black, Blue, and Gray. Durable, all-welded 18 gauge x 1-1/2" square tubular steel frame for added rigidity. 3000 lb. capacity. Welded base plates allow floor anchoring for stability. Scratch resistant enamel finish. Features two fixed shelves with raised lips to retain contents. Available in 3 Bench Tops: 1-5/8" thick almond plastic laminate, 1-3/4" thick Shop Top or 1-3/4" thick maple top. Optional 4" casters for mobility, reduce capacity to 1000 lbs. Available in Beige, Black, Blue and Gray. Durable, all-welded 18 gauge x 1½ square tubular steel frame for added rigidity. 3,000lb capacity. Welded base plates allow floor anchoring for stability. Scratch resistant enamel finish. 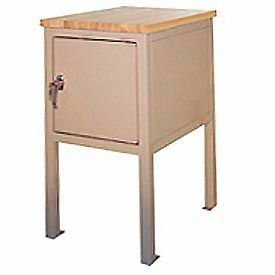 Features a 14"H locking cabinet for secure storage. Available in 3 Bench Tops: 1 5/8 thick almond plastic laminate, 1-¾ thick Shop top or 1-1/4 thick maple top. Optional 4 casters for mobility, reduce capacity to 1,000lbs. Available in Beige ,Black, Blue, and Gray. Durable, all-welded 18 gauge x 1½ square tubular steel frame for added rigidity. 3,000lb capacity. Welded base plates allow floor anchoring for stability. Scratch resistant enamel finish. 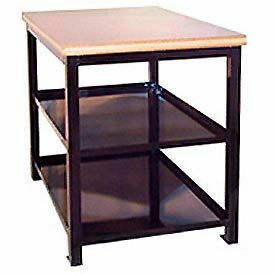 Features one fixed shelf and one 12"W x 19 1/2"D x 4 3/4"H drawer. 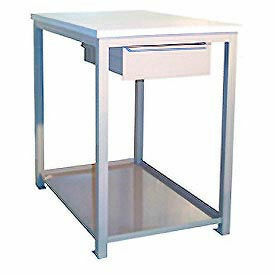 Available in 3 Bench Tops: 1 5/8 thick almond plastic laminate, 1¾ thick Shop top or 1¾ thick maple top. Optional 4 casters for mobility, reduce capacity to 1,000lbs. Available in Beige ,Black, Blue, and Gray.